I did it! While mum had some fantastic company, drinks stations and CAKE after her 22-mile training run last weekend, I knew I emphatically would not for mine. I anticipated my longest run before the Plusnet Yorkshire Marathon being a bit of a slog all by myself, but it actually turned out to be a pleasant way to spend a Saturday afternoon. Gawd, if you had told me that when I was training for my first 10K just 18 months ago…! I loaded 3 episodes of Desert Island Discs and 2 of Marathon Talk on to my iPod, popped some money and Clif Shot Blocks in my pocket. I planned my route on Mapometer – two loops, incorporating two of my favourite routes with lots of cycle paths and a couple of miles of trail to keep things interesting. I just got my head down and just did it. As I have researched the fuel provided at the stations at the Yorkshire Marathon, I bought Lucozade from petrol stations and corner shops en route. I’ve been doing this for a few weeks now, and will make sure that my stomach is ready for it during the marathon itself. By about mile 15, I got Stockholm Syndrome with the Desert Island Discs castaways and the Marathon Talk hosts, as they had been my only company for hours and hours (Russell Brand and Zadie Smith; Martin Yelling and Tom Williams, I now love like my friends). The afternoon was tiring, of course, but no more sore than a run of a couple of hours would have been. There was no real pain in my body and the only truly mentally taxing part was that I’d slightly miscalculated my route, and so I had to run past my house at 21 miles and go round the block. Horrifying. Never again. Now I need to eat ALL THE FOOD. Today, my empty stomach roused me so I jumped out of bed and made a special Sunday treat breakfast – banana and walnut pancakes. I’d really recommend getting an American cup measurer – it makes recipes like this so much easier than faffing on with scales. 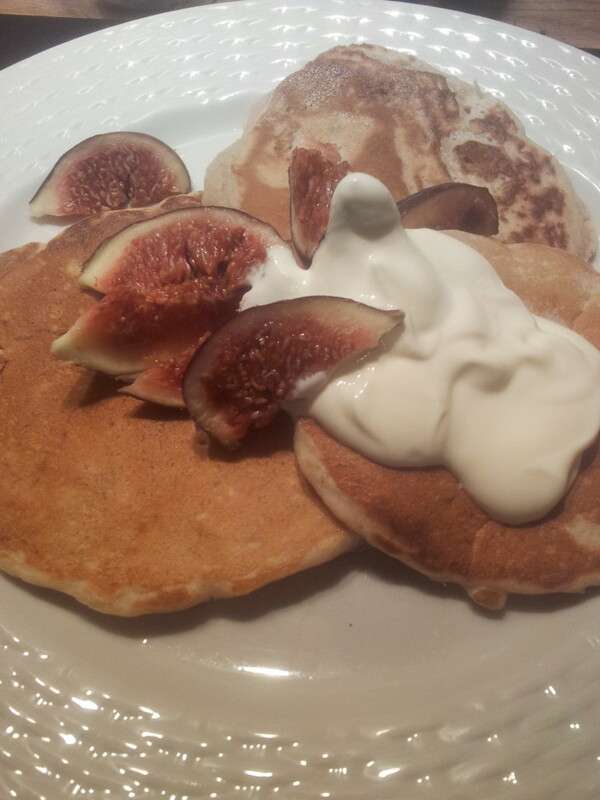 Served with creme fraiche and figs, these pancakes feel well deserved. Three weeks to marathon day. I hope it goes as well as yesterday. Measure all of the dry ingredients in one bowl, and the wet in another. Mix the two mixtures together. It will be quite lumpy, don't worry. Heat a griddle over a medium-high heat. Mine is fantastically non-stick, so doesn't need oiling, but you can add a little butter or vegetable oil if you're not confident with yours. Ladle the mixture into the pan in batches and cook on both sides until golden brown. Serve hot, with creme fraiche and fruit. Savoury Breakfast Muffins - Two Recipes in One!